You’ll need: 250g Blue cheese, 4 ripe pears, 24 walnuts, sea salt and freshly milled black pepper, a packet of rocket leaves – enough for 4. For the dressing: 1 Tbs Cider or white wine vinegar, 1 Tbs water, 1 tsp white sugar, 1 Tbs Maille Whole Grain Mustard, 75ml sunflower oil, sea salt and freshly milled black pepper. To make the dressing, place the ingredients in a screwtop jar and give it a good shake. Toss the rocket leaves in the salad dressing and set them on a platter. Cut the pears into eight slices and put them higgledy piggeldy onto the leaves. 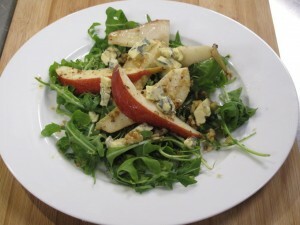 Sprinkle with the crumbled blue cheese and strew over the walnuts. Add salt & pepper to taste.